I am so glad I read these reviews. Now I know not to call Empire for even a quote (which I was going to call today, by the way). I am so thankful y'all took time to voice your complaints. The actors in the television advertisement must be getting well paid for their services; they look so happy, content and satisfied. However, the commercial is so convincing; sounds like everything would be a piece of cake for unsuspecting consumers. Whew! Thank you, thank you, thank you. I'll stick with my small town providers. Local providers, local products, local laborers and local customer service. I am so glad I decided to visit this website. Now I won't be joining the ranks of the disgruntled. Review #167664 is a subjective opinion of User167664. Their contract has a binding arbitration clause restricting the options of customers, in the event they are not happy. I had a feeling their offers were too good to be true. Like the saying goes, "if it sounds too good to be true, it probably is". Thanks everyone for posting about them! Steven, "...kicked Empire out of the state..."??? Please elaborate on this. My father just had a rep in his home today in Fayetteville NC. I was a new sales person looking for a job and got hired by Empire. After 2 days, I quit. They have used car sales tactics and quadruple the price so they can lower it. "Let me call my boss and see if I can get you a better price" My training boss was from another branch in North Carolina where they kicked Empire out of the state. Don't even let them come to your house. I felt sorry for the people who did buy from them and didn't know they got ripped off. 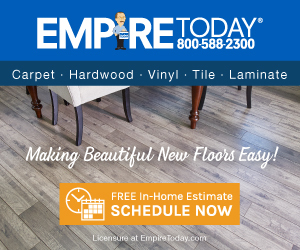 Maybe Empire Carpet's song should go "1-800-RIP-OFF!" Sing it with me now. I'm so glad I read your reviews FIRST before buying. Wow, I am shopping for carpet and wanted to check out the reviews for Empire Carpet. After reading these scary reports, I am crossing Empire Carpet off my list forever. They sound like dirty scammers who hire felons. Thanks for saving me from a potentially horrible experience! I am with you! I, too, was ready to get a quote for much needed carpet and flooring. Thanks to everyone who took the time to write their reviews. Sounds like this company should be shut down!